LATEST NEWS: The ECWF Cape Cod 2018 will take place on the "rain/no wind" date of September 22-23, 2018! The windforecast for the original date of September 15-16 was very light (more details here). Come and join us for two days in racing and wind freestyle competition! Demo gear from Fanatic, Duotone (formerly North Sails), and Naish will also available. The first Annual ECWF Hatteras will take place in Avon, NC, in the week from October 20-27, 2018. Organized by Mike Burns and hosted by Ocean Air, this is the successor of the original ECWF Long Island. Register here for the ECWF Hatteras, or check the announcement for more info. The 5th Annual ECWF Cape Cod took place on September 16-17, 2017 at Kalmus Beach in Hyannis. About 20 windsurfers competed over two days in racing and light wind freestyle, and tried demo gear from Fanatic and North. The 4th Annual ECWF Cape Cod took place on September 17-18, 2016 at Kalmus Beach in Hyannis. 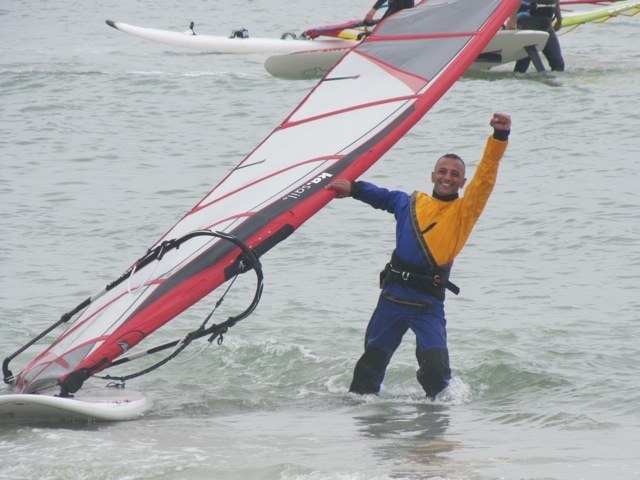 About 40 windsurfers competed for two fun days in racing and freestyle. Our special guest this year was Boris Vujasinovic, the fastest windsurfer in the US. In 2015, Boro reached a top speed of 51.16 knots in the speed channel in Lüderitz. That's about 2-3 times as fast as typical windsurfing speed! Boro won the speed category in GPS racing, and gave speed tips in a Q&A session during the event. The 3rd Annual ECWF Cape Cod took place on September 19-20, 2015 at Kalmus Beach in Hyannis. 32 racers and 23 freestylers competed over two days in conditions ranging from light winds to fully planing winds. Rich Simons and Pam Levy were crowned as the new King and Queen of the Cape. 2013 PWA World Champion Kiri Thode won the Pro freestyle competition ahead of Australian Rail Ride Master Pierre Coupal, Long Island Legend Mike Burns, and local freestyle Nikita Piankov. Many thanks to all sponsors, competitors, helpers, and everyone who donated to the event! The East Coast Windsurfing Festival Long Island 2015 took place on June 6th and 7th at Heckscher State Park. 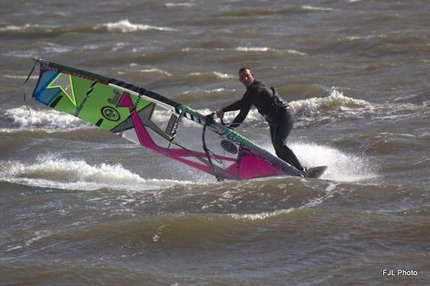 Over two days, more than 30 windsurfers cometed in racing and freestyle. Many thanks to all competitors, helpers, and sponsors! 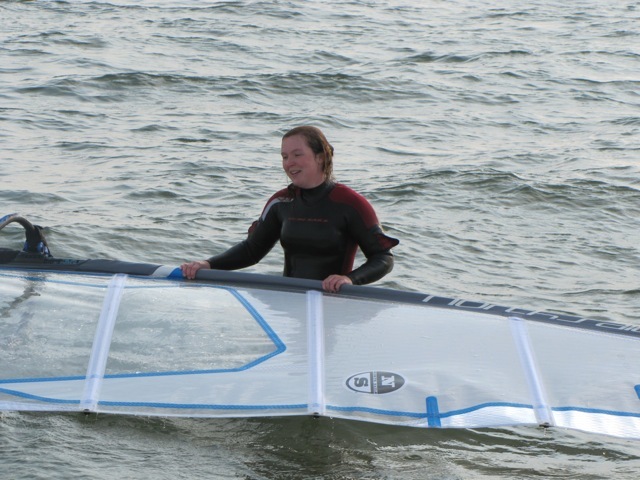 The second annual East Coast Windsurfing Festival Cape Cod took place on September 13-14, 2014 at Kalmus Beach in Hyannis. Over two days, 38 competitors and many onlookers had fun participating or watching races, freestyle, and demonstrations by Caesar Finies, the inventor of Flowstyle and one of the best freestylers in the world, to participate at the ECWF. Many thanks to all contributors who helped us raise funds to pay for Caesar's air fare, and to all helpers and sponsors! 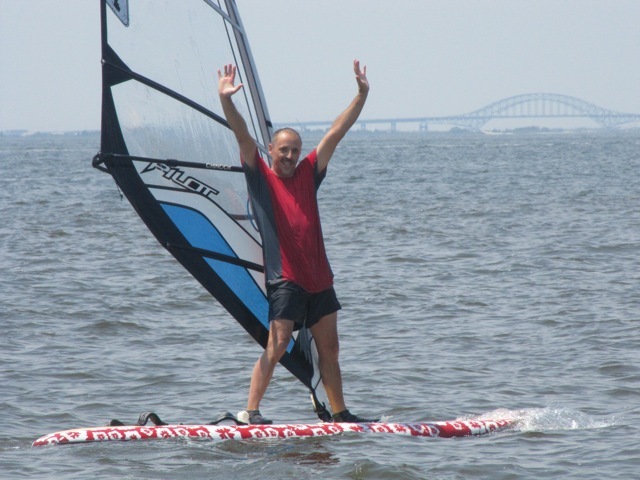 The East Coast Windsurfing Festival Long Island took place at Heckscher State Park on June 14-15, 2014. About 30 competitors had lots of fun racing and competing in freestyle. Results are here. To simplify the organization of future East Coast Windsurfing Festivals, we have formed the East Coast Windsurfing Association (ECWA). The goal of the ECWA is to promote the sport of windsurfing through amateur competions and instructions. The ECWF Cape Cod in Hyannis on September 14-15, 2013 was a big success. Over two suny days, 34 competitors raced and competed in freestyle heats, watch by numerous spectators on the beach. Periods of very light wind were filled with SUP relay and "long distance" races and the first-ever tow-in freestyle at Kalmus Beach.